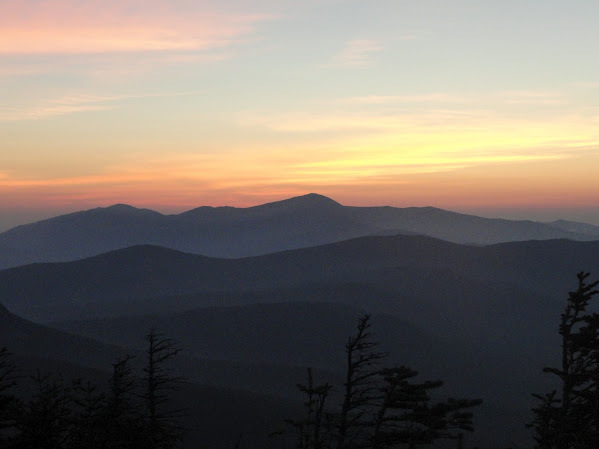 2020 Vision Quest | Bonding Together in the Heart of the Pemi Wilderness! 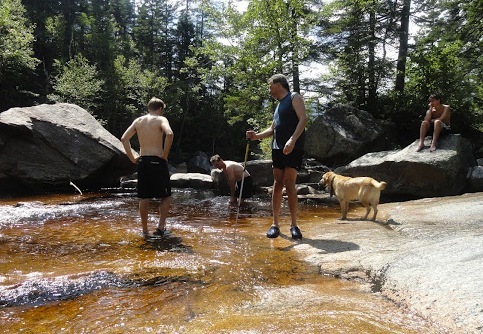 Bonding Together in the Heart of the Pemi Wilderness! This three-day deep wilderness hiking excursion on Aug. 4-5 produced four of the most remote peaks in the 48 and brought us 80% of the journey to our ultimate goal! It also provided an unparalleled experience as the result of a simple choice in the midst of this expedition: I had been told the sunset from Mt. West Bond was amongst the most incredible experiences within the White Mountains, so our trip was structured so that we could ensure that seeing it was likely. There is a quote by Sally Edwards that my wife Tracy shared with me which helped to motivate our choice: “When was the last time you have done something for the first time?” We decided that we would not only marvel in the West Bond sunset, but we would also sleep at Guyot campsite in our tents for a short night, rise early, and be on the summit Mt. Bond to watch the sunrise the very next morning. It is a choice that I will never regret and an experience I will never forget! From my view, this was an “old school” hike with four University of New Hampshire alumni from the 80s as the centerpiece (John, Matt, Mark and Randy). But 2011 graduate and trip leader Kyle might disagree with the notion. 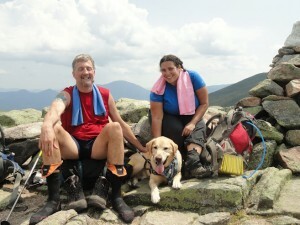 So might non-UNH students Tracy and Erik or even Guiding Eyes graduate the Mighty Quinn! Whether we had never met or not in many years, this group had some high expectations to match the hiking chemistry of the last several trips that have been exceedingly kind to the 2020 team. The group and the trip would surpass all hopes and expectations for more of the trail magic that motivates many to undertake these experiences. Friday’s car spot was quick and efficient with a bit of significance to noting that our cars were spotted roughly 40 highway miles away from each other. This certainly highlights the distance of our traverse even though the shortcut through the mountains made for part of that difference. Day one had the car spot and a leisurely start on the Zealand trail. Just 2.75 miles of fairly gentle trail had us at the fork for the Ethan Pond trail where we would camp, ¼ mile below Zealand hut. Shortly beyond the junction we found magnificent campsite opportunities and had a private grotto with all three tents set up and lunchtime spent laughing and marveling at the beauty of our campsite for the night. We were so far ahead of schedule that we geared down for a 2-mile gentle hike to the infamous Thoreau Falls. This subtle railroad grade had been fully returned to a natural trail and had many narrow points along the beautiful White Cliffs but provided no unreasonable challenges. It did share views of the entire Zealand-Guyot-Bond ridge including the mass of the Z-Cliffs where we hoped to be for lunch the next day. As we emerged to the falls and cascades, an incredibly beautiful sunny day heated the rock slabs and created a refreshing and soothing contrast between icy stream and sunny slab! With no pressing time schedule and being entirely surrounded by a wilderness valley, our trip might have been complete just for this much experience. The dynamic of the friendships had already begun to shine. Quinn’s “mighty leap” from atop a boulder and into the pool plunged him under the water and wagging tales soon were snoozing in the sun in complete contentment. Dinner’s debates over dehydrated meals and the sharing of tastier delicacies allowed for an early bedtime and gentle breezes. Early risers were packed up and reaching the hut before breakfast was served for those guests. 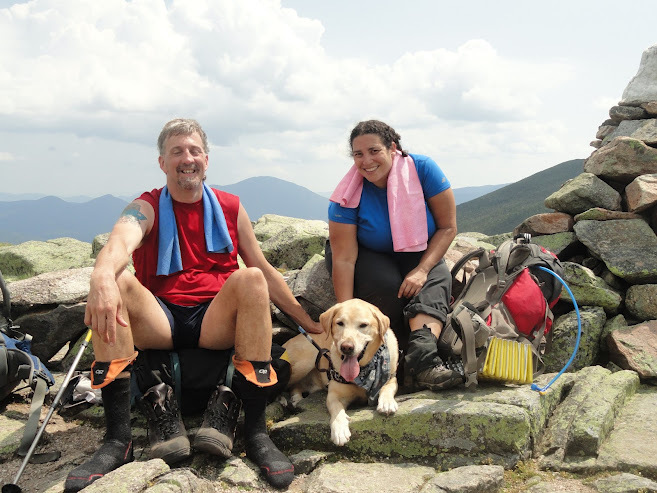 We met several friends and connections and had to force ourselves away to reach the trails in a timely schedule but not for lack of opportunities to enjoy reconnecting with people. 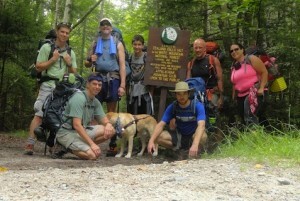 It is simply marvelous to feel so much a part of a much greater hiking community! Zealand is steep and the rocky trail slowed progress enough that eventually Kyle took over guiding me while Quinn enjoyed the hike in trust of someone he believes has the experience to guide me without his supervision! We worked hard and reached the overlook of the Z-Cliff with delight. This view adorns the cover of Steve Smith and Mike Dickerman’s book “48” and with good reason. It is a spectacular view which make the mountain climb completely worth the journey, a foreshadowing of the feeling we would have many times and in many places along this trip. Atop the sparse views of Zealand we rested briefly and sent out our first Spot message to our Facebook community before repacking and heading for the last serious climb up Mt. Guyot. Knowing that the spaces were limited at our remote destination, we wished to ensure our group could claim a tent platform and so a little equipment adjustment send everyone but Kyle, Tracy, Randy and Quinn ahead to set up tents and be certain our night’s rest was secure. The heat and humidity were considerable, once again reminding me the fantastic invigoration my “Chill Towel” provided throughout the entirety of the hike! The sustained steep of this glorious peak effectively ended the elevation gain for our entire trip even though the col rule prevents Guyot from counting as a peak over 4,000 feet. (Don’t tell that to thirsty bodies and weary legs which earn every step of the climb.) The views from the peak are excellent but an unnamed sub-peak we dubbed “Quinn’s Knoll” was in our opinion the most fantastic viewpoint we’d ever experienced in the entirety of the White Mountains. All around are simply remote and majestic peaks, valleys and deep wilderness views that will likely remain with anyone so fortunate as to have earned their way out here on a day with any visibility! A very short jaunt brought us to the junction with the trail spur to Guyot shelter. It’s a quarter mile of challenging hike down into the campsite, but the water source is renowned for the cold and freshness that the day’s efforts and heat had made so enticing. We had an excellent spot as we rejoined our companions and we were fantastically ahead of schedule 2 with several hours to relax, unpack, feast and prepare for our sunset hike. Eager for the highly anticipated trip, Tracy and I set off with Quinn to get a head start on our faster moving companions who were prepping everything for the potential of the early morning departure. Tracy guided me in a somewhat romantic appreciation of how well our work together had allowed for such hiking opportunities. Rested and with most pack weight left at our tents, we made our way out of the spur and the reasonably short distance to the West Bond Spur. 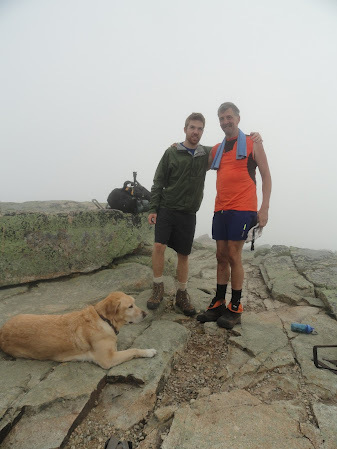 Another half mile with some tricky points and we were on the craggy outcropping that thrust West Bond into a Pemi overlook and a pair of horseshoe canyons of breathtaking grandeur! Here all seven of the Bond companions came together for a few hours of the most inspirational relaxation. The sunset developed steadily and gloriously between Mt. Garfield and Mt. Lafayette. We laughed and shared the experience as much as possible along with a little dark chocolate and red wine that had made the long journey with us! Our spirits had climbed incredibly and exponentially higher than the trails and yet another moment of magic was added to an incredible hike. It was during this time we decided for certain that we would rise early enough to ensure we savored the Mt. Bond sunrise consecutive to this sunset. Though it did mean we begrudgingly wound our way down from West Bond and back to our tents. John guided me and we were the last to return to camp. The moon lit the trail for him with a headlight ready as needed. There was a serenity in the night during which I could not have wanted for better company to share and discuss. We rose for 3:30 though Matt was sufficiently eager as to have been long awake and vastly packed for the trip. The plan had been for my slower pace to require me to leave sooner but the entire crew was so efficient we all departed effectively together. The site of 30 (maximum) had been filled with more than 80 hikers and people literally had fallen asleep on the trail leading down to the site! We navigated them mostly by moonlight with Kyle guiding me again for the speed and silence. The moon again shone so brightly the morning hike required no other lights for the sighted of the group. We had again that same serenity of wilderness night to envelope me in an atmosphere of awe and appreciation. Our crew all too easily gave the shout of exhilaration that the summit had been obtained and well before the sunrise would unfold for us. The summit of Bond is large enough for all of us to unpack, begin breakfast preparations and appreciate the boulder seats thrust out of the summit. 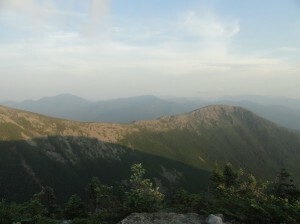 Views were a full 360 degrees of wonder and perhaps highlighted by the coming light over the looming shadows of the massive Presidential range to our east and a bit north. Ever so slowly details flooded into the darkness and the sun rose to welcome in a brilliant and beautiful morning. I wondered how many have been so fortunate as to appreciate the sunrise on one of these amazing mountains and then a consecutive sunrise on another such peak! I had not and may not ever again but if I were to think on how much was given in the experience I would chide myself as a foolish man for not planning another attempt. The chill temperatures eased considerably and though a wind was still brisk, we turned our steps towards Bondcliff even as low clouds raced over the Lafeyette ridge, across the Pemigewassit Wilderness and completely enveloped Bondcliff in a wall of thick fog. It gave the impression of hiking through the Scottish Highlands and provided an entirely different type of wonder. Companions were lost in the fog only a few short steps ahead or behind. The voices would call to with an eerily hollow distance. 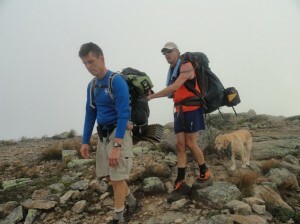 Matt led me down a trail that had so extremely challenged me in my traverse two years prior. As is often the case when someone guides me for the first time, we become a team and experience the partnership and friendship in a way I rarely find anywhere else in the world. The foggy isolation only enhanced that feeling as a friendship more than twenty years separated after college was easily appreciated anew for the people we each had become. It was not long before we stood on the summit of Bondcliff with fog occasionally opening enough to show the daunting depths of the cliffs that plunge into the Hellgate gorge below! This was our fourth and final peak of the journey and our group had bonded so naturally and thoroughly in the experience. We knew that ahead lay Bondcliff’s version of the “Hillary Step”. We knew there was a steady descent into the Lincoln Woods and we knew a very long, albeit level, trek through to the trailhead remained. Still, for me the group had finished the journey to completing our bonds of friendship and the rest would be vastly in reflection and appreciation for all that had been experienced! Mark was the person who had connected me with the others back in my freshman year at UNH. We worked together at the MUB cooking breakfast before classes and he introduced me to the others in the fraternity of Phi Kappa Theta. We were not a typical fraternity and these are atypical men still today. I was proud to see the quality of people that were there and the suggestion we probably had a solid foundation back in school as well. 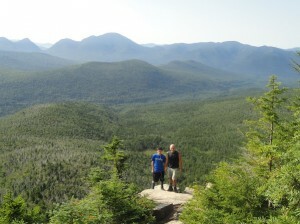 So Mark guided me the stretch of narrow trail from Bondcliff to the Wilderness trail. Each guiding is different and each system takes time to develop but always there’s a chance to appreciate a little bit of the view from the other’s perspectives. This is true of trail and life and no less so with my long absent friendship with Mark. 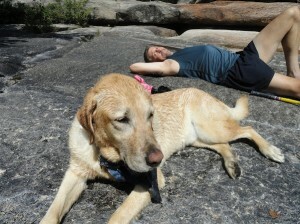 The years melted away though not so easily from a body tired by a long weekend of hiking. At the Wilderness trail Quinn took over for the easiest of the final miles of the journey. While he could have done many other sections he accepts that sharing the experience is part of the enrichment of the entirety of the adventures. He’s a patient pup! Now it was time for Tracy and me to ease behind as others made great time striding towards the suspension bridge and the stream soak that would clean and refresh from the weekend. We were clear by 3:00 easily and the rain did not begin until all were in vehicles retrieving cars. We came together one final time to feast and toast an incredible experience. 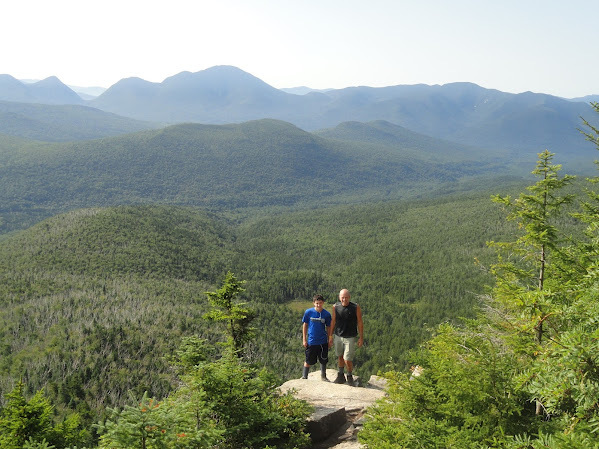 Though I say it’s about the people more than the peaks, the marvels of the natural wonders within the White Mountains were definitely a powerful enhancement to our bonds of friendship. I think about my belief in the phrase “Choosing the Right Response” which titles a book I hope to someday publish. Choose your friends and your paths wisely and the rewards will continue for the entirety of your lives. I have look forward to a lot more of life and adventure ahead and to choosing friends such as these and journeys such as this! I had never read that blog. What great memories!!! !